Outdoor living can be defined as an extension of the home into nature. In California, we are lucky we can spend the majority of the year outdoors whereas many states don’t have this privilege. The extension of our primary living quarters can greatly influence the way in which we organize and use our outdoor spaces. As the architectural structure rests like an island within the property boundaries, the surrounding emptiness of the land is the canvas for which landscape architects create an oasis of spaces that subjectively speak to an individual homeowner. In residential design many elements make up the broad spectrum of outdoor living and are customized to individual preferences. We organize the outdoors into a series of rooms connected by pathways and walkways much like the home where rooms are connected by hallways and corridors. We define the spaces around a set of ‘building blocks’ where we carry the language of the architectural components into the landscape. 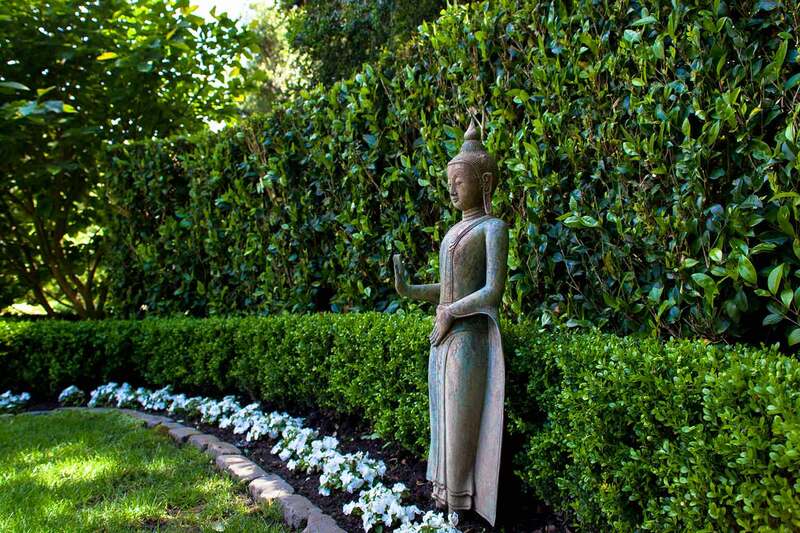 Stone walls, screens, or planted hedges represent ‘walls’ in the landscape. Wood or carpet flooring is translated to stone, concrete or even grass. Lastly, the roofs or ceilings of the house are seen in the landscape as arbors, umbrellas or trees. These elements are the interchangeable components that inform the configuration of spaces in the landscape. Using the ‘building blocks’ to organize the outdoor living spaces sets the framework for the desired features and areas our clients want to see on their property. As architects of the land, we analyze and study how these ‘rooms’ function relative to one another. We design keeping in mind the hierarchical importance of use by often placing active areas (sports courts and grass fields) together while maintaining passive spaces (dining and entertainment) in other locations. 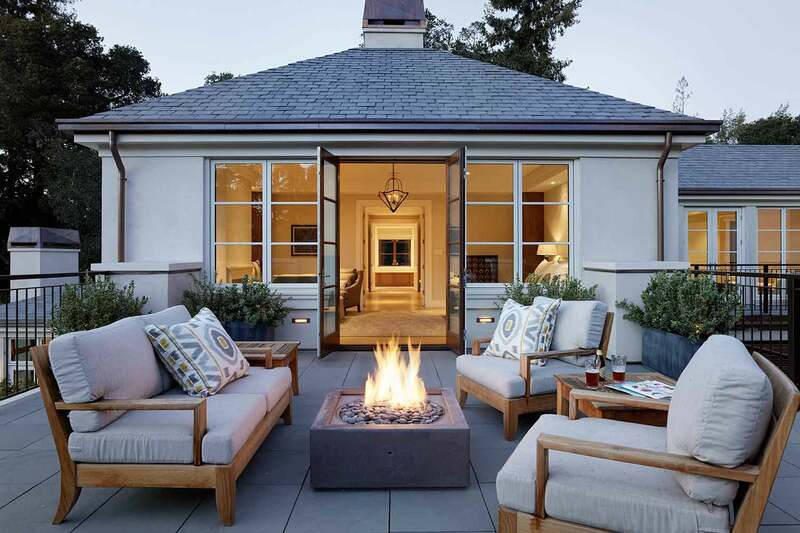 Areas like fire pits or meditation gardens are flexible features to have readily accessible to the home or may in fact be a retreat further into the landscape. 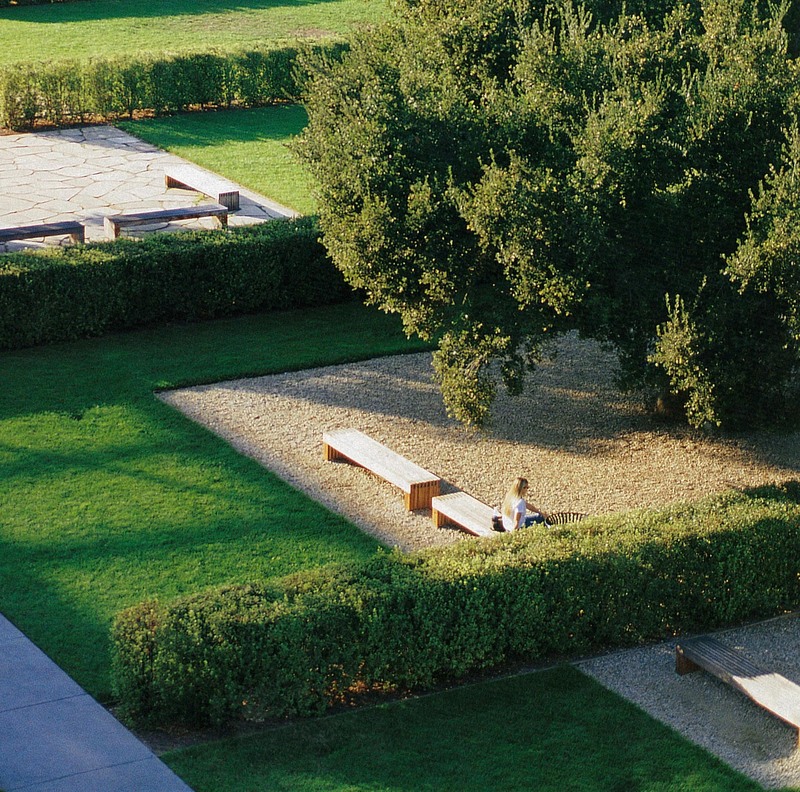 As we build the landscape to delineate spaces, we study the paths of travel to and from the outdoor rooms. These transitions are not only a way to get from one space to another but also offer an experiential opportunity. 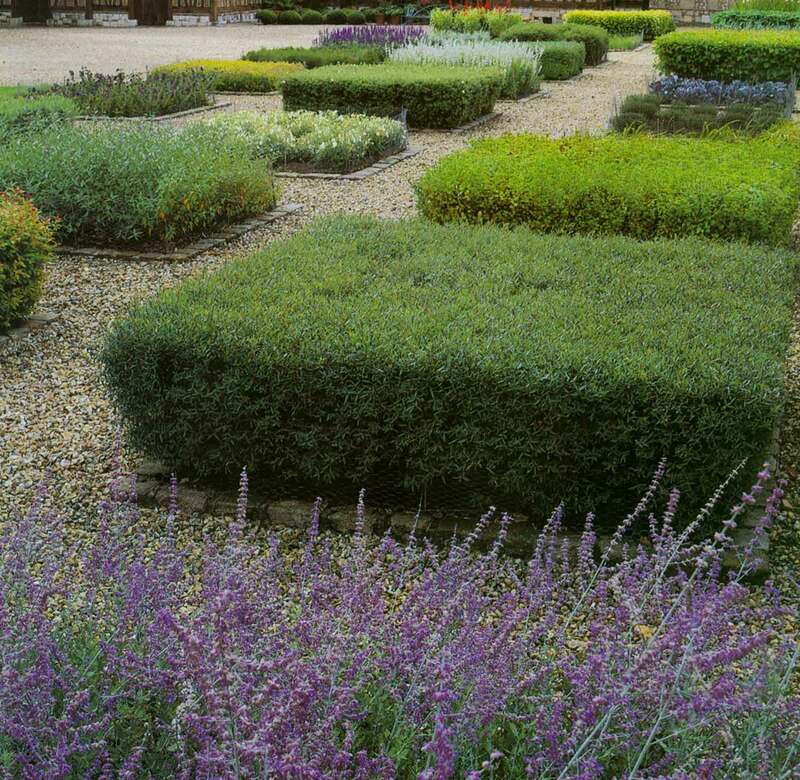 Whether the transitional spaces are open by walking through a parterre garden or closed by an allee of trees, both instill a feeling of enjoyment as one goes from point A to B. The organized framework of the landscape is reinforced by the materiality, details, and elements housed in each location. As Landscape Architects we design with a holistic approach that weaves the selected materiality throughout the project tying one space and experience to another. The palette of materials are selected to extend the home into the outdoors. A seamless and effective way to achieve this continuity is by selecting a uniform paving which can be finished to work both indoors and outdoors. Carrying the materiality and details of the interiors outside cohesively marries the architecture and landscape. The hardscape materials are a strong tying element but the planting is just as important in defining the structural integrity of the property. 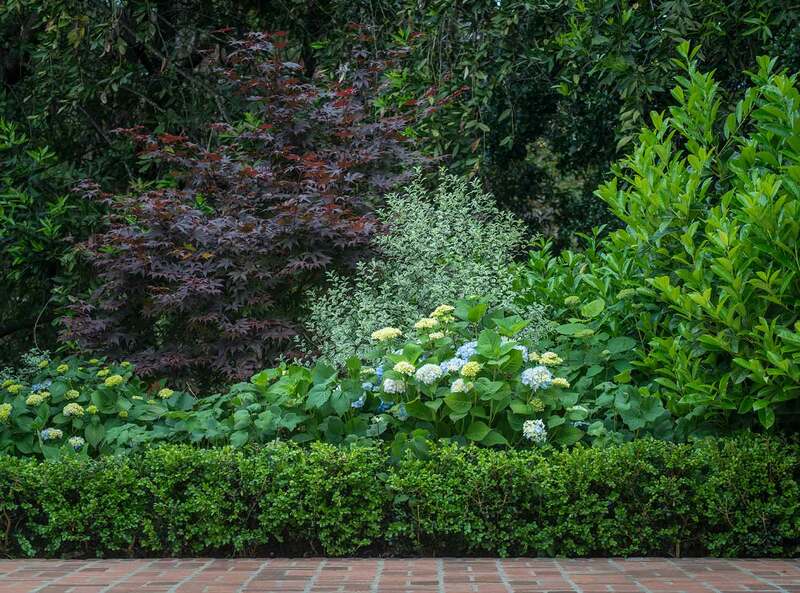 The planting encapsulates the landscape design with its layering of textures and colors. The outdoor rooms are literally brought to life by something that grows and changes over time. 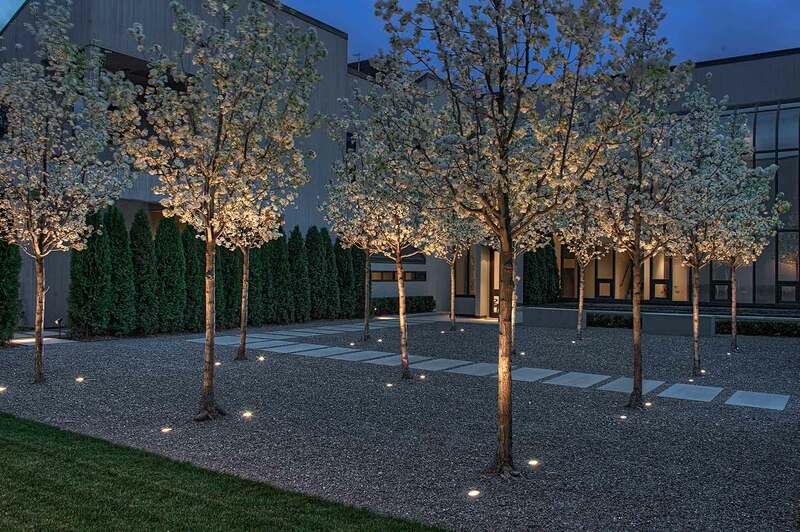 The finishing touches of lighting, sculptures and site furnishings animate the garden to reflect the personality and lifestyle of the homeowners. Outdoor living can become (if its not already) an indispensable part of our lives. How we choose to extend beyond the four walls can be challenging and often overwhelming. At Terra Ferma Landscapes, we listen to and develop relationships with our clients in order to provide support and expertise to bring the indoors outdoors.